Definition at line 40 of file CFluxMode.h. Definition at line 43 of file CFluxMode.h. Definition at line 37 of file CFluxMode.cpp. Definition at line 39 of file CFluxMode.cpp. Definition at line 44 of file CFluxMode.cpp. Definition at line 50 of file CFluxMode.cpp. References CTableauLine::getFluxMode(), CTableauLine::isReversible(), mReactions, and mReversible. Definition at line 66 of file CFluxMode.cpp. Definition at line 69 of file CFluxMode.cpp. 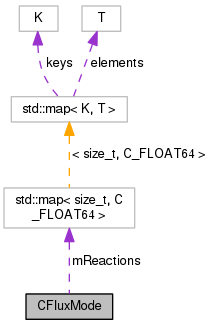 Referenced by CQNewMainWindow::elementaryModeTriggeredSlot(), CEFMTask::getFluxModeDescription(), CEFMTask::getNetReactionData(), QFluxModeAnimation::getScales(), and CEFMTask::getSpeciesChanges(). Definition at line 74 of file CFluxMode.cpp. Definition at line 111 of file CFluxMode.cpp. Definition at line 89 of file CFluxMode.cpp. Definition at line 79 of file CFluxMode.cpp. Definition at line 84 of file CFluxMode.cpp. Vector containing an index to a reaction and the multiplier for that reaction. Definition at line 51 of file CFluxMode.h. Referenced by begin(), CFluxMode(), end(), getMultiplier(), isReversed(), and size(). Definition at line 56 of file CFluxMode.h. Referenced by CFluxMode(), and isReversible().